[From IMDB:] Two brothers return to a small mountain town in search of their long lost parents only to discover that the place has a monstrous taste for tourists. Even the supporting cast do a good job, albeit with some markedly weaker material to work with. 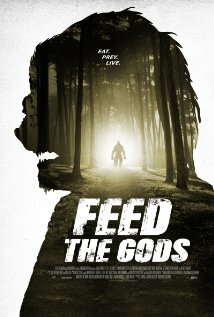 But all of this ultimately fails to make up for the biggest weakness of Feed the Gods, which is the weakness of its premise. It’s never adequately explained why the locals of Tendale are doing what they’re doing, or what they get out of it. I just found myself repeatedly wondering why would choose to stay in the place – and I blame this on the vagueness of the backstory that’s shared with the audience. Still, Feed the Gods does have its good moments; and there’s enough of a comedic bent to the movie that had me cracking a smile here and there, even as I found myself questioning characters’ decisions and motivations. I can’t say that I didn’t get anything out of Feed the Gods – because I was entertained, by Roberts in particular. I just don’t know if they were the right things to be taking away from a big foot movie.